One of my favorite people to run into at a conference is Ginger Bolton (aka Janet Bolin). She is friendly and funny and is always working on something new and fabulous! And just so you know she did her research for this series, here's Ginger with a recap of her driver's training during Writer's Police Academy (yes, that's thing)! One of the programs I looked forward to most at the Writers’ Police Academy last summer was the defensive driving course—in a real police car on a practice track. Our instructor and three of us authors buckled ourselves into the cruiser. I admit that I was hoping to drive a brand-new cruiser, but in a way, it was a relief that ours had retired from active service more than a few years before. The instructor dove us around the course and showed us what we were going to do. First, we would drive the cruiser through a couple of turns. This was probably a sort of driving test, a last-ditch effort to make certain that we were able to drive without, er, driving into a ditch. It was diverting, all right. On a straightway, we were to accelerate to twenty miles per hour, and then let our foot off the gas and head straight at a traffic cone without braking or turning. Never fear, we were not going to hit that cone. There were escape routes to the right and to the left of it. The instructor would tell us at the last nano-second whether to take the right or the left escape route. Next the instructor took us through the serpentine obstacle course and showed us how to quickly slalom through a series of traffic cones placed very close together. Uh-oh again. This is not a good ride for anyone with even the slightest tendency toward queasiness. Ginger Bolton ready for a high speed chase! The first author took the wheel and did a fine job with both the diversion and the serpentine. I drove those first turns faultlessly. I accelerated to twenty miles per hour. I took my foot off the gas. I was barely slowing, and I was heading straight for that cone! “Right!” yelled the instructor at the last nano-second. Who has time for little tricks like holding up your thumb and forefinger with both hands to see which one makes an L-shape? Okay, I told myself, I’ll do better on the serpentine. I drove to it and steered hard and fast. Too hard and too fast. Clunk, clunk, clunk, clunk. Four cones down. I was given another turn around the course. I was determined to ace it. I was heading straight for that cone . . .
“Left!” yelled the instructor at the last nano-second. That time on the serpentine, I knocked only three cones over, but then, I’d already killed the other four. The instructor had me drive him back to the cones so he could set them up again for the third author, who drove the course perfectly. And you know what? I would have, too, maybe, if I had practiced about, oh, say, a thousand times. At least I think I would have. I would probably get the knack of the serpentine. But figuring out which is right and left in a split second? Um, maybe not. How about you, Readers? Are any of you what we call directionally challenged? Ginger Bolton is the pen name of author Janet Bolin, author of the Threadville Mysteries. Oh, Ginger, your book sounds like a perfect one to add to my teetering to-be-read pile. I’m looking forward to meeting your Emily and finding out what happened to Georgia . . . .
My total lack of directional sense is legendary in my family. All of them can all figure out how to get wherever they want to go while I can get myself lost [no joke] walking around the block . . . .
Oh, Joan, it's so nice to meet a kindred spirit! I'm not directionally challenged but I live with someone who is. He'll say, "Turn right up there" and will vaguely gesture toward the left. "You mean the other right?" I ask. He sighs and admits that he does. I feel for your navigator. Drivers don't always see which way I'm pointing, which is, of course, always right! I mean always correct... The research is hard on the waistband, but someone has to do it. Welcome Ginger/Janet! And the cover is adorable. Not sure I'd have the nerve to do all those maneuvers in front of four people. I'm still scarred by driver's ed and that was 40 something years ago!! Thanks Lucy/Roberta! It's great to be here, and I love that cover. Driver's Ed...I'm still not sure how I managed to turn the car to block the entire road on that uphill curve. I'm not directionally challenged and I don't drive. But I will use my hands to indicate right or left. I actually like driving. Navigating is another story. Just curious. You're not a Libra, by any chance? I've found myself in trouble when there are two choices to make, right and left being the only possible in that arena. Give me three or more, though, and I can ace it. GPS is a godsend, but thank goodness for the graphics that go with the spoken directions. Poor Georgia. She has nothing but trouble! Navigating roundabouts is the pits, even for the GPS which occasionally sends us onto the wrong spoke of the wheel. We had fun at WPA, didn't we! And it would have been more fun if you'd been in that car. Well, maybe not for you. I loved Threadville, too! But I'm happy to have a setting around donuts, too! Thanks, Jenn. Threadville research was less fattening. But donuts are tastier than fabrics. Hi Janet, looking forward to reading Emily's first 'case'. And yes, I can totally relate. North-south I do fine, but east-west is my downfall. I have to think it through every time--find north, etc., which is a problem when you're in the middle of traffic and trying to figure out where you need to be! And don't ask me to figure it out by where the sun is. What if there are clouds? Or shadows aren't pointing the way you know they should be pointing? I've always wanted to go to Writers Police Academy - but that road test sounds more than a tad daunting. But so useful if you're going to write a car chase. I do know right and left, but I am directionally inverted if you tell me to head north or south. Congratulations on the new series! I thoroughly recommend Writers Police Academy. It was fun and informative, and I met lots of great people, like Cathy Akers-Jordan who chimed in above. Hallie, you live in Boston. You'd ace the road test! Hallie, you should go to WPA! Liz and I went in 2009 and it was fabulous. I'm overdue for a second dose. I'm not that reliable. I do get it correct, probably more than half the time. So no one trusts what I say. Maybe that's why I like to write fiction??? Hi Janet. Nice to see you at JRW. Yeah, when we rented a car in Britain, I drove and my partner navigated. He'd say "turn right" or "turn left" (including roundabout approaches) exactly opposite to reality. Fortunately, we both knew what he meant. Right = The easy way and Left = The hard way. After a few days, he just said, Turn the Easy Way or The Hard Way. Worked like a charm. Couldn't do that road test, I'm a little nervous on the road and get carsick easily. Usually good with directions but not in the UK where I never knew which way to go and risked to be run over all the time. I would never dare drive on the left side. I would never, ever be able to switch back to driving on the right. That is, if I could drive on the left at all. The very idea gives me the shivers. LOL - I too am left/right impaired. What a great story, and a true sense of grit. Congratulations on the new series! Thank you! The people who showed true grit were the writers in the back seat, poor things. The new book sounds like a lot of fun, Ginger/Janet! And yes, I am profoundly left/right challenged. I always thought it was just me, being dorky, until I learned that it's an actual thing called kinesthetic dyslexia. Until I got a compass in my car and learned how to navigate by that I was always turning the wrong way, getting deeply lost . . . there are lots of stories, but my favorite was the time my husband, who could always figure out how to get from point A to point B, stopped at a corner in a town we'd stayed in before, and asked me where I thought our hotel was. I pointed right. He said, "Yep. Just as I figured," turned left, and found the hotel. My navigational sense was so bad, he depended on it to be wrong! Oh no! A word for the condition! What if both people in a couple have kinesthetic dyslexia? Uh-oh. Janet Janet Janet! You have saved my life. Truly. I am so relieved that it is not just me! HURRAY! And north or south? Ptu. NO idea. I mean, How am I supposed to know that? And Janet, HOW long ago did we meet? And remind me, what was the coincidental story about it? Congratulations on the series! You had me at Deputy Donut. I was amazed when I first met other people who had the same problem. I guess I'm lucky that I don't have trouble with north and south. Yet. The coincidence was that my brother went to one of your signings and mentioned that his sister had just landed a book contract for mysteries. A day or so later, I announced my contract to the Guppies chapter of Sisters in Crime. Yes yes! xxoxo SO funny. And yes, Karen, I am a Libra. AND left-handed. I can't imagine that's not all connected. I'm right-handed, but my mother was left-handed, and her mother was right-handed. That makes me second-generation confused. Hank, I didn't know you were a leftie!! My hub is a lefty, and so is Gigi Norwood. They make a pretty good case for lefties being smarter--as do you! Janet, we spend our winters in Phoenix and John has still not got the hang of directions around here. I say "It's north on 7th Street. He says "Which way is north.?" And I say, "I'll give you a hint. That big thing over there is called North Mountain!" It's in a grid. Sigh. Makes perfect sense. How is anyone supposed to know that North Mountain is to the north of where you are at the moment? North Mountain has to be south of something, right??? LOL! I'm with John, Rhys. It's taken me years to learn the Phoenix grid. I would love, love, love to do a defensive driving course, but I'm afraid I'd have the same problem as Ginger. I literally have to look down at my hands and make the L with my thumb and forefinger to be sure I have left. I can't tell you how many times when I was driving and Ross was navigating, he'd say, "Turn left," and I would put on my blinkers, and he would say, "Your other left, Jule." 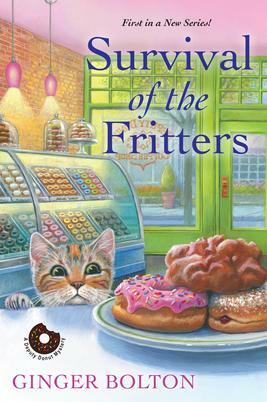 I love the description of SURVIVAL OF THE FRITTERS, and it will tell you what a donut lover I am that I was more horrified by "stale donuts" than by "murder." I empathize. The thought of stale donuts is rather horrifying. Memo to self--gobble all of them ASAP. Hmmmm. I think I'll go make some, now. I'm craving donuts just reading the description of your new book, Janet. Congrats! Janet, it definitely is a book I need to read! I intend to be on the lookout for it! For my entire life I've lived in CT, not always in the same town, but always in a town on Long Island Sound. I know the Sound/water is always south, and I have no trouble figuring other directions from there. But when I'm in a land-locked town, I might as well have vertigo! One of my sisters lives in northern CT (I know this because it's away from the Sound:-) She lives on a lake. After she lived there a few years I figured out where east is, because the sun rises over the lake. I had to sleep at her house a few times to realize this. (I was more impressed by the beauty of the sunrise!) I do fairly well with directions once I learn how to get somewhere, more or less. However, I've learned NEVER to drive on highways in central CT, but that's more because the need to switch to another highway always becomes apparent after I have been unable to change lanes in time! I've often lived where water is to the south, also. How dare anyone put it anywhere else? How are we supposed to get our bearings? The Merritt Parkway is charmingly scenic, but it's best to drive the entire thing, and not try to get off. Janet, you had me at fritters! Apple fritters are my favorite morning indulgence, but I don't allow myself to have them too often. There's a bakery called Donut Bank across the river in Evansville, IN that has the best apple fritters I've ever tasted, and it's good that I don't get by there often, as I don't have a lot of self control with them. Your book sounds great, and maybe I could allow myself a fritter while reading it. While the other drivers in your group on the driving course might have performed according to directions, I bet they weren't half as entertaining as your drive was. I don't think I'm left/right challenged, but having to go one way or the other under stress might make me so. Thanks for sharing your book and driving course experience with us today. I'm usually pretty good about right and left, but in a situation like that, I might have gone the wrong way, too. I call it being proactive. That was one cone that I did *not* hit. I am the most directionally challenged person I know. Left, right, east, west, it's all an adventure. I have no internal navigation system whatsoever. Seriously, the Hub and Hooligans have debated putting a tracker on me, so I feel of you, Ginger. If someone yelled a direction at me, I'd likely just duck and cover and run over ALL the cones. LOL! Really looking forward to your new series! I'm pretty good at finding my way around. Most of the time. Thanks for inviting me to blog with you today, Jenn, and I hope to run into you...oops, wait, bad choice of words...*see* you at another conference soon! Janet/Ginger, just the title of your book cracked me up. I love the description, and my hub used to run a 911 dispatch so I know I'd like your Emily. 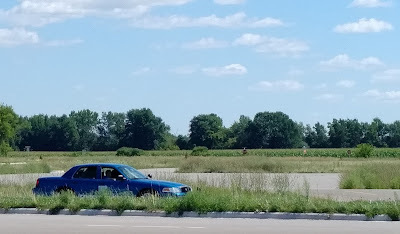 And since my former cop hubby has been giving me driving instructions for more than twenty years, I might do okay on the defensive driving course. Sounds like great fun to me. I am not too directionally challenged--otherwise I'd never have managed my way around London all these years. BUT I do occasionally get totally disoriented. Very frustrating, as I'm sure some of you will agree! I cackled when I thought of that title. And then the publisher gave it a really cute cover. You mean you drive on the wrong side of the road? And get around London? You're my hero. When I was in gym class, I used to "write" my initial in the air and then clench that fist all class so I would know which way to go. Still do that every once in a while. Also a Libra. I do know east, west, north, and south around my house because I live on the East Shore of the river, and the garden is on the south side of the house. Away from my house, forget it. Loved your other series so looking forward to this one. Funny! I had a friend who couldn't tell her right from her left, so when she gave directions, she would first cross herself to remind her which was her right hand. Some people found it disconcerting. Hi Ginger! Your cover is beautiful and I love donuts. I'm not directionally challenged, but I am dependent on my GPS.